Dozens of hydrogen airships exploded or burned in the years before before the Hindenburg disaster finally convinced the world that hydrogen is not an acceptable lifting-gas for airships carrying people. After an emergency landing near Echterdingen, Germany, LZ-4 was was torn from its temporary mooring by a gust of wind and ignited after hitting a stand of trees. LZ-6, owned by the world’s first passenger airline, DELAG, was destroyed at Baden-Oos by a hydrogen fire which began when a mechanic used petrol to clean the ship’s gondola. LZ-12 ignited and burned in its hangar at Friedrichshafen while being deflated. The passenger airship Schwaben was destroyed by fire at the airship field at Dusseldorf when its hydrogen was ignited by static electricity from the ship’s rubberized fabric gas cells. Melvin Vaniman’s airship Akron exploded 15 minutes after departing Atlantic City, New Jersey, during an attempt to cross the Atlantic. An in-flight engine fire ignited the ship’s hydrogen, killing all aboard. The ship broke away from its ground crew after being damaged during removal from its hangar; it crashed nearby and was destroyed when its hydrogen ignited. L-10 was destroyed by a hydrogen fire during a thunderstorm near Cuxhaven as it was returning to its base at Nordholz. It is likely the ship rose in an updraft and released hydrogen which was ignited by the atmospheric conditions. All 19 members of the crew were killed. SL-6 exploded and burned on takeoff, killing all aboard. The ship caught fire and was destroyed while being refilled with hydrogen at the zeppelin base at TÃ¸nder. Both ships were destroyed by fire in their hangar at Fuhlsbuttel when hydrogen was ignited during refilling operations. While L-24 was being returned to the shed it shared with L-17 at TÃ¸nder, a gust of wind lifted the ship into the roof of the shed; a light bulb ignited a hydrogen fire which destroyed both ships. 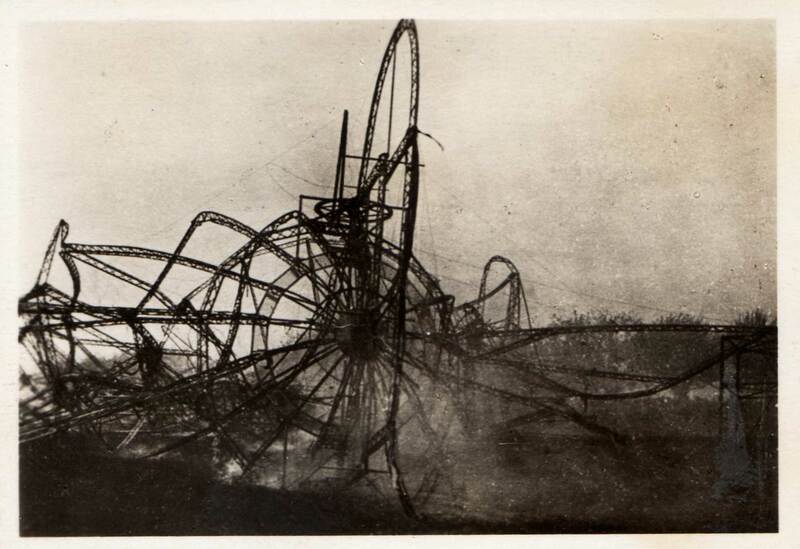 SL-9 burned after being struck by lightning in flight over the Baltic, killing all 23 persons aboard. L-57 burned in its shed at the airship base of Niedergörsdorf”“Juterbog after being damaged by high winds during docking operations. An explosion at the zeppelin base at Ahlhorn ignited the hydrogen of all four ships. L-59 exploded in flight and crashed at sea near Malta, killing all 21 members of the crew. L-59 was the famous “Africa Ship” which proved the feasibility of intercontinental zeppelin travel by carrying 15 tons of cargo and 22 persons on a record-breaking 4,225 mile flight during a military relief mission to German East Africa in November, 1917. Goodyear’s Wingfoot Air Express ignited in mid-air and crashed through the skylight of the Illinois Trust & Savings Building in Chicago, Illinois, killing three persons on the ship and ten bank employees and injuring another 27 people. All subsequent Goodyear airships were inflated with helium. The British-built R-38 (intended to serve as the United State Navy airship ZR-II) suffered in-flight structural failure over the city of Hull, England and crashed into the River Humber where it ignited, killing 44 of the 49 men aboard. The United States Army airship Roma (built by Umberto Nobile) ignited when it hit high-tension electrical wires near Langley Field at Hampton Roads, Virginia, killing 34 of the ship’s 45 crew members. After the Roma disaster the United States government decided never again to inflate an airship with hydrogen. The French-operated Dixmude was destroyed over the Mediterranean Sea near the coast of Sicily by a hydrogen explosion visible from miles away. Dixmude’s gas cells had apparently been contaminated with air, creating an explosive mixture, and the ship may have been lifted by updrafts in a thunderstorm, causing hydrogen to be vented and then ignited by the electrically charged atmosphere. The poorly-designed British R101 lost altitude and sank into a hillside near Beauvais, France. The impact was slight and caused few if any injuries, but the ship’s hydrogen ignited and the ensuing inferno killed 48 of the 55 passengers and crew. Hindenburg was destroyed by a hydrogen fire at the Lakehurst Naval Air Station. Has anyone tried using CH4? It is about 16x the weight of H2 and also flammable, so what is the advantage? I’m guessing not enough of an advantage for anyone to actually attempt to use it. I am also doing a report on the Roma and the US military zeppelin program for my 8th grade independent study because of my great great grandfather. I am trying to locate info on the flight crew of the Roma. I very close friend of ours, Alberto Flores was one of the few who survived the crash. he died in 1988 at the age of 91. My great, great grandfather William O’loughlin was a civilian engineer working on the Roma’s six liberty engines when she went down. My family and I still regard him as a hero. And the rest of the world regards him as an idiot. This comment is insensitive and uncalled for. I agree. The comment was totally uncalled for. I just noticed Fred’s comment and was tempted to delete it, but Antony and Sandra did such a good job with it that I will leave it up; maybe it will make Fred think twice about posting things like this in future. I commend you for doing so. My pet peeve is moderator/censors. The huge majority of them are capricious in the extreme. Trolls on websites merely display their own stupidities. By troll, I do NOT mean someone who merely disagrees with the status quo, as some do. The Akron referred to here is the airship Melvin Vaniman flew in 1912. Different Akron…the first one blew up in 1912. The second one, the USS Akron, helium filled, has the dubious distinction of having the worst loss of life of any airship when it was lost in a storm off New Jersey in 1933. Hydrogen is in a flammabilty class by itself. Jet fuel, which is less easily ignited than gasoline, is practically inert when compared to hydrogen. And, besides, the hindenberg blew up after hitting an iceberg. It was the Titanic that burned at Lakehurst. Do try to get the facts right. You are just trying to be funny, right? We all know that the Titanic was an ocean going passenger ship. No one has ever thought otherwise. If you are in fact serious, you desperately need help.